For Romney: 15-Car Motorcade To Concession Speech; One Car To Get Home : The Two-Way From full protection and full entourage, the losing presidential candidate quickly goes back to reality. When he returned home early Wednesday from his concession speech, GOP nominee Mitt Romney rode in the back seat of a car driven by his son. Secret Service agents were on their way elsewhere. Before the vote, GOP nominee Mitt Romney and his running mate (Rep. Paul Ryan, in the background) were guarded by watchful Secret Service agents. After results came in, the agents quickly disappeared. When it comes time for the Secret Service protection to end and the entourage to disappear, it happens quickly for the losing presidential candidate. 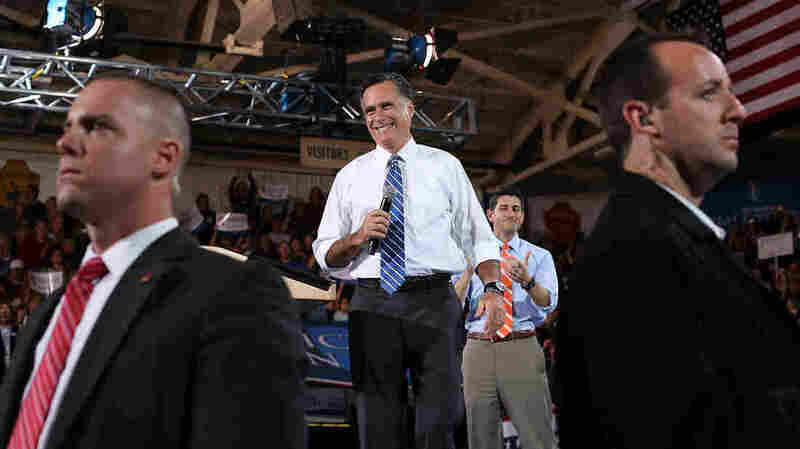 "The Secret Service detail guarding Governor Romney since Feb 1. stood down quickly. He had ridden in a 15-car motorcade to the Intercontinental Hotel in Boston for his concession speech. He rode in a single-car motorcade back across the Charles River to Belmont. His son, Tagg, did the driving." Before sending Romney off, Ambinder adds, it's likely the Secret Service agent in charge checked with local police "to make sure that his protectee's home won't be overrun by protestors and supporters all of a sudden." But other than that, it was back to being private citizen Romney. "Came out into the pouring rain and whipping wind. The man known to the Secret Service as Javelin got into a silver Saab driven by his oldest son, Tagg. His wife sat in the front seat, Romney in the back, and he was expected to sleep at his home in Belmont."